tion and 256 cases with histological evidence of H.
were found to be significantly related to having H.
(DDW) 2013 in Orland o, Florida. with the highest prevalence of H. pylori infection . fornia, where 37.6% of the population is Hispanic . approximately 370 miles of porous border with Mexico. pital located in Maricopa County, Pho enix, Arizona. Maricopa Medical Center (MMC) is located in Phoenix. sies from the gastric antrum. the country of birth (Tables 1-5). as the reference variables, respectively. Table 1. Univariate analyses—dichotomous variables (general characteristics). *Continuity-correcte d chi-square test with 1 degree of freedom. Table 2. (a) Univariate analyses—dichotomous variables (clinical characteristics); (b) Univariate analyses—continuous variables. *Continuity-correcte d chi-square test with 1 degree of freedom; **Independent groups t-test. Table 3. Multivariate logistic regression analysis. 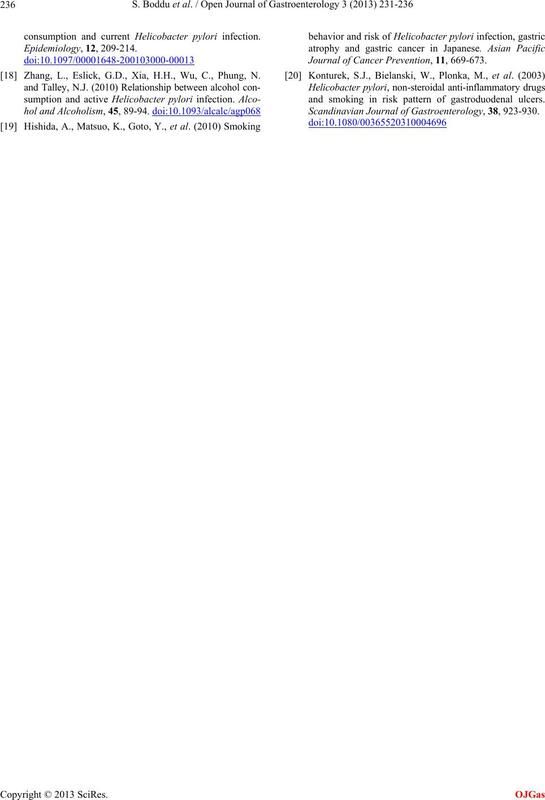 Nagelkerke R-squar ed = 0.292. Table 4. Analysis of US born vs. foreign born variable (N = 118). logistic regression model. 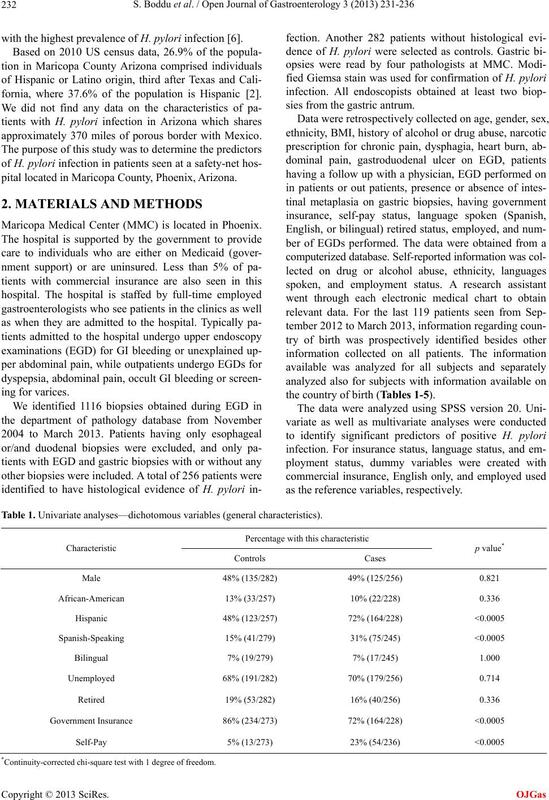 A total of 103 cases were available for this analysis. to those who do not report abdominal pain. 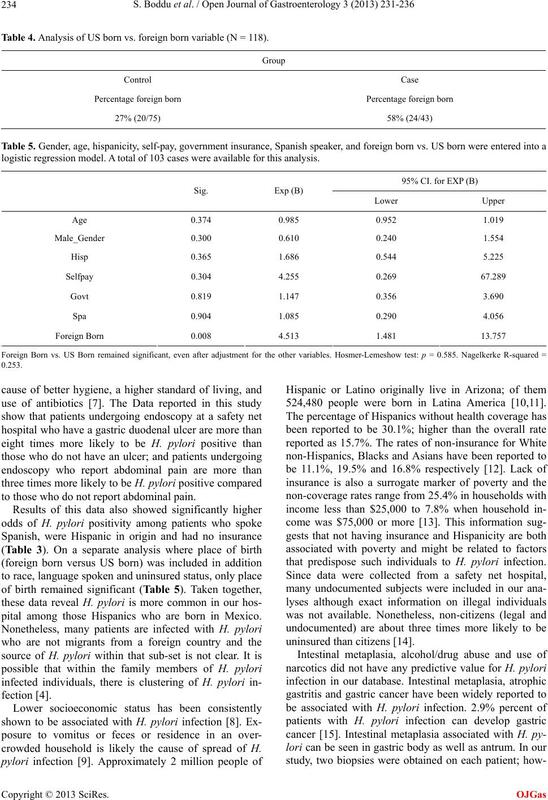 pital among those Hispanics who are born in Mexico. crowded household is likely the cause of spread of H.
524,480 people were born in Latina America [10,11]. that predispose such individuals to H. pylori infection. and controls in reported subjects of this study . Arizona and seek medical care at our safety net hospital. classified as a class 1 carcinogen by WHO . panic origin and state: 2010. 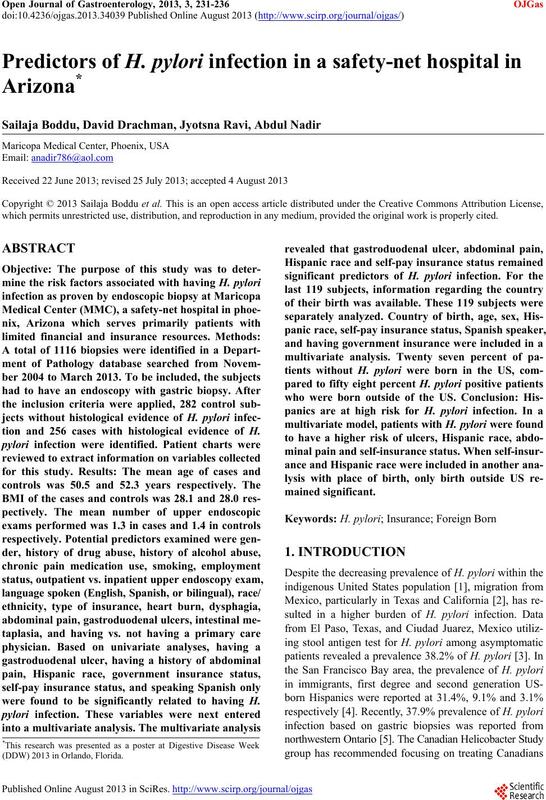 Journal of Epidemiology, 162, 351-357. Sethi, A., Chaudhuri, M., Kelly, L. and Hopman, W.
parities. 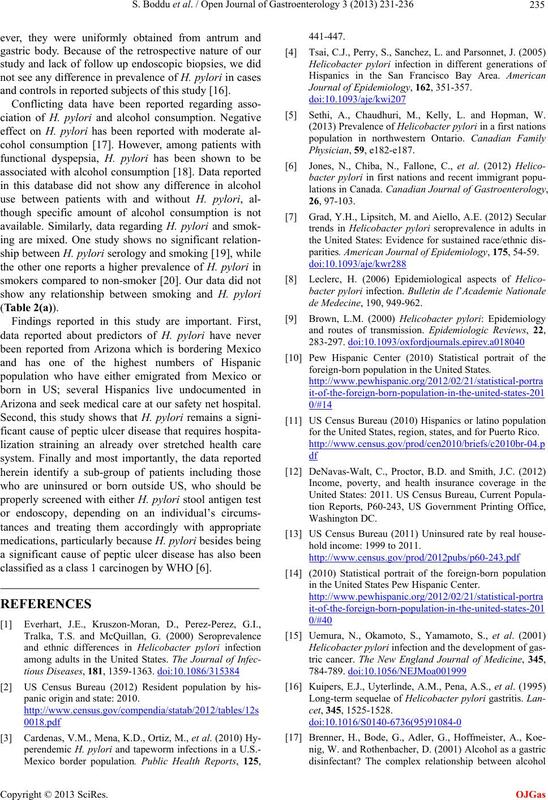 American Journal of Epidemiology, 175, 54-59.
foreign-born population in the United States. for the United States, region, states, and for Puerto Rico. hold income: 1999 to 2011.
in the United States Pew Hispanic Center. consumption and current Helicobacter pylori infection. 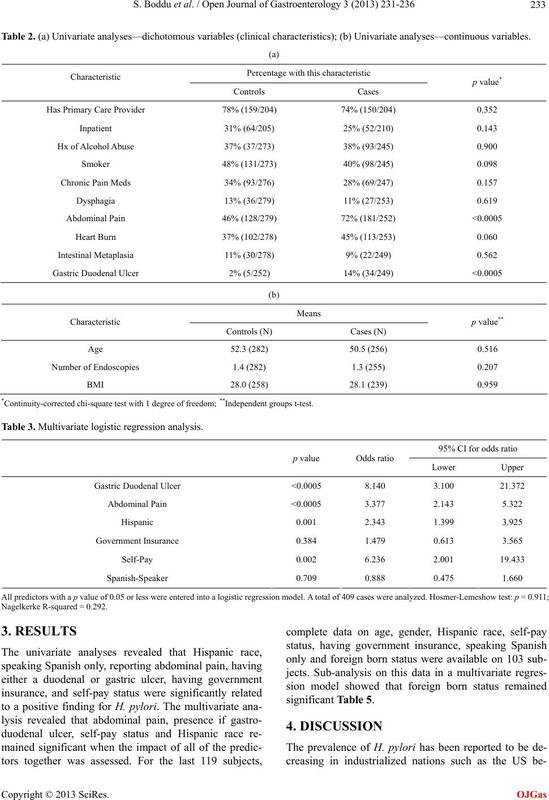 Zhang, L., Eslick, G.D., Xia, H.H., Wu, C., Phung, N.
Journal of Cancer Prevention, 11, 669-673.
and smoking in risk pattern of gastroduodenal ulcers. Scandinavian Journal of Gastroenterology, 38, 923-930.